The brain is optimized to pay attention to many things at once. This is why kids with attention-deficit/hyperactivity disorder (ADHD) can play action-packed video games for hours upon hours but can’t sit still in a classroom for 20 minutes if it’s a humdrum (to them) topic. Many people with ADHD can focus only when what draws their attention is interesting, exciting, attractive, rewarding or even threatening. Prescription medication, such as stimulants, can improve focus, rein in impulsive behavior and make a big difference in some symptoms…but they also have their share of side effects, namely lack of appetite, weight loss and sleep problems. These can be particularly troublesome for kids, as stimulants can worsen the sleep or stress management problems that often come with ADHD. But there’s another approach to consider, one that looks at and treats the ADHD brain a whole different way, and it’s drug-free. It’s called neurofeedback training, and it starts by looking at ADHD not as a disease or a disorder, but as a superpower…not as a deficit of attention, but as a deficit in the ability to control attention. The answer is learning how to gain control by learning to regulate brain activity. Background: Your brain has five waves—gamma, beta, alpha, theta and delta, each with its own purpose. People with ADHD have a high ratio of the amount of theta to beta waves in the brain’s frontal lobe. Theta waves in general are slow and drive daydreaming, creativity, receptive attention, remembering and fantasy. This is a good thing for most people, but not when it happens all the time, as it does in many ADHD brains. When theta is “stuck” at a high level, it’s hard for the person to pump the brakes or inhibit the automatic aspects of their attention. When there is too much theta, it overpowers the beta waves, which are more involved in thinking, problem-solving, decision-making and processing information. Addressing ADHD (regardless of how) would result in a better theta-beta ratio. One solution for people with ADHD is to teach the brain how to rein in the high ratio when it’s time to focus by reducing theta and increasing beta voluntarily. The training: Neurofeedback—or biofeedback on the brain—trains the brain to reduce the amount of theta and allow the person to control impulsive, automatic or reactive actions. The biofeedback process starts with capturing a picture of your brain by creating a quantitative electroencephalogram (QEEG) brain map—think of it as the equivalent of an EKG of your heart. An EEG technician will place a cap with electrodes on your head to record resting brain activity. Baseline activity with eyes closed and with eyes open is then compared with a database of age-matched EEGs to determine where your brain is unusual, identify likely bottlenecks and resource limits, and help determine the specifics of your training. Patterns that suggest ADHD are between 80% and 94% accurate, depending on research study, so QEEG serves as a hypothesis generator more than a diagnostic test. Computerized attention testing is usually done alongside the QEEG and helps validate population differences in attention performance. 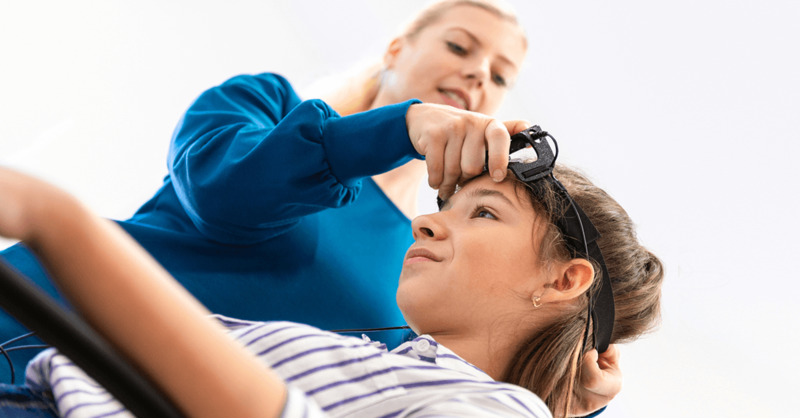 Training with neurofeedback consists of sessions during which a few electrodes (rather than the QEEG cap) are placed on your scalp to measure your ongoing brain waves as you watch images, play games or listen to sounds. When your brain shifts in the right direction (with a brief reduction in theta and an increase in beta waves, as an example), a reward or an audiovisual feedback based on the brain activity is triggered. Rewards can be any increase in stimulus, such as bursts of color, a Pac-Man eating a stream of dots or the onset of musical notes. When the brain does the opposite (the theta surges higher or beta drops, to continue the example), the feedback stops—the colors fade, the game pauses, Pac-Man stalls or the music level drops. The game playing in the session is effortless and mostly involuntary. The neurofeedback process gently trains the brain to make more or less of different brain waves and attention resources. Moment to moment while playing the game, the brain gets information about the direction it should move in, and it will attempt to learn from this information over the next day or two, much like the time it takes for the effects of a gym workout to show up. Most people with ADHD need around 40 30-minute sessions, usually done three times a week over a three-month period, with periodic assessments to see how well it’s working. Some research using QEEG brain maps has shown that a brain can go from extreme excess theta to typical theta in as little as three months, and the benefits tend to last after training is complete. While an analysis of a handful of early studies on neurofeedback training showed mixed results, a recent study done in Thailand involving 40 children found it was a promising alternative treatment, and a new analysis review with an international team of researchers is currently under way to further evaluate it. There are many more studies under way or recently completed for ADHD and most show excellent and long-lasting results. Availability: Neurofeedback training is available in most areas of the country. The key is to make sure that the cognitive-care center you choose has QEEG-mapping technology because this is the most accurate and reliable way to get a training approach tailored to your brain. Insurance may cover some of the costs of the treatment, but it is not generally well-covered, and a course of training to address ADHD can be upward of $5,000.